Like dogs, I'm sure I will write more then one gratitude about cats. Today is the first of those days. While more complicated than dogs, there is so much to love about our cats. They're playful, curious, loving, and infuriating in pretty much equal parts. Cats were around growing up too, my Mother seemed to view them as the right pet to have, requiring minimal help from herself. There were a lot of times when it felt like our cat was my only source of comfort in my family. 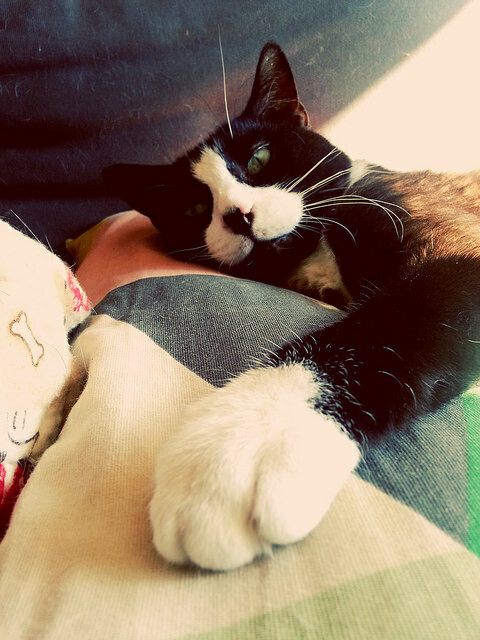 Today I really enjoyed spending time sitting on the sofa with our tuxedo kitty. Of the two cats we have, he's most bonded to me. He's anxious, particularly about food, and really never lets me sleep in. He's attacking the bedroom door before 7am most mornings, anxious he won't get a meal and needing comfort. At night he often sits on my cushion next to me while I meditate, occasionally even bugging me to do my bedtime sit if I'm still on my laptop late.